We had a movie schedule to show at school the other day, so we chose Meet the Robinsons. The movie has a great example of growth mindset, encouraging learning from failure instead of giving up, which is a huge lesson for middle school kids to learn. Plus, it is an awesome fun film from the animation wing of Disney. Lewis (Daniel Hanson) was an orphan who desperately hoped to become an inventor some day and his desire to be adopted fueled his efforts to invent the proper gizmo. When he comes up with a big time invention for the school science fair, he draws unwanted attention from Bowler Hat Guy (Stephen J. Anderson), a man from the future looking to steal Lewis’s invention. However, Wilbur (Wesley Singerman), another person from the future, returned in a time machine to help Lewis recover his invention, stating that the future depended on it. 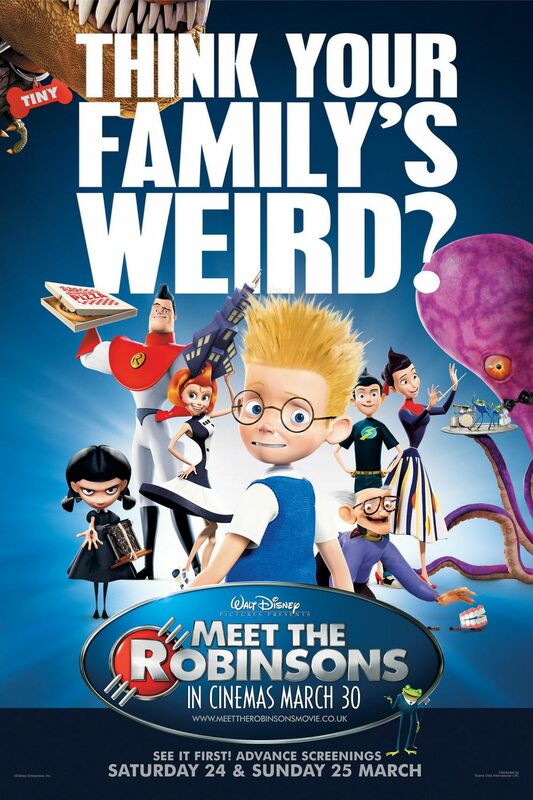 Meet the Robinsons is very funny and the story is clever. The writing and dialogue does an extremely solid job of entertaining and enhancing the story. Time travel stories are always potentially confusing, but Meet the Robinsons avoids these cliches and traps with a well developed and competently written script. Sure the story is a bit predictable, but the reveal of the villain and what happens with him is one of the best parts of the movie. While I saw the Lewis story coming a mile away, that does not detract from the overall enjoyment of the movie. The part with the T-Rex is both dramatically exciting and remarkably funny. As I said in the opening, the message of growth mindset in the movie is very positive and helps provide an important message… keep moving forward. Middle Schoolers really have to learn this lesson because so many times, they simply give up when something gets too tough or when they have something that they fail at. Lewis shows them that failure can be something to celebrate as well. The animation is as great as it always is for Disney and the brightness of colors leap from the screen. They have a wonderfully creative villain in the bowler hat named Doris and the end result of the confrontation with Doris and Lewis is as simple and awesome as any conclusion in any Disney film. There may be too many characters involved in Wilbur’s family in the future, though the film does an admirable job trying to give a personality to each. My favorite is hearing the dulcet tones of Adam West in the voice cast. However, we really know very little about any of the future characters and that is a weakness. Meet the Robinsons may not be the greatest Disney film ever, but it is certainly an entertaining watch and it has a great message that is important for young kids to understand.